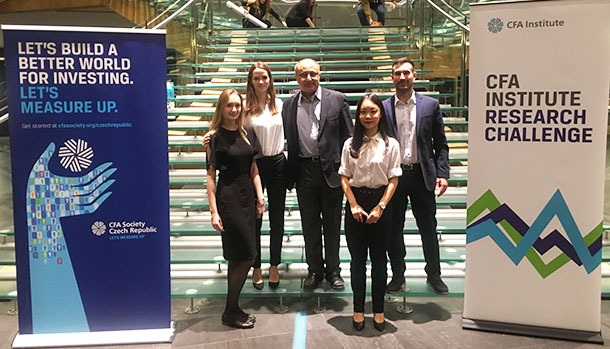 A team of our Business Administration students has won the Czech Republic round of the CFA Institute Investment Research Challenge competition. The students in the team are: Monika Vidličková, Elena Ragozina, Kiko Sugita and Filiberto Cottrer. The competition is run by the Virginia-based CFA Institute, whose mission is To lead the investment profession globally by promoting the highest standards of ethics, education, and professional excellence for the ultimate benefit of society. The institute’s flagship is the CFA program, a professional qualification consisting of three examinations that cover all that a competent analyst might be expected to know, and is often regarded as equivalent to an MBA in finance. The Investment Research Challenge is a student competition, with universities all over the world participating. Teams are required to produce an equity research report on a designated company, and to present their work to to a jury of professionals drawn from the financial community. In the Czech Republic the competition is administered by the CFA Society Czech Republic, the local chapter of the CFA Institute, and has been run since 2010. This year the organizers chose ČEZ the dominant Czech electricity producer. The participants in the Research Challenge effectively take a crash course in financial analysis, well exceeding what is typically taught at the bachelor’s level. Besides the finance, the students needed to write a well-structured report in good, comprehensible and professional English and to present their findings. The winning team in the Czech Republic will go to Zurich in April for the European round – if they succeed there they will proceed to the global final in New York. This result is particularly impressive since many of the other teams were from masters programs at the most prestigious institutions in the country. This is the fourth time that the team representing UNYP and Empire State College has won the Czech round of the competition; we won in the years 2013, 2014 and 2015. No team from the Czech Republic has yet won the regional round, but we have high hopes for our team this year.